In 2010 an apartment in Paris was opened, untouched, after 70 years. Inside was a treasure trove of furnishings and art ranging from the 1880's to pre-World War II. The apartment was owned by Marthe de Florian, a little-known courtesan, and inherited by her granddaughter, Solange Beaugiron. Among the treasures inside was a portrait of Marthe by Giovanni Boldini, a famous portrait painter of the era. 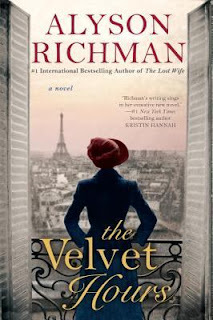 In The Velvet Hours, Alyson Richman has fashioned an extraordinarily beautiful and moving imagining of the story behind the apartment. The facts known about Marthe de Florian and her granddaughter, Solange, are sparse and sometimes contradictory. Born Mathilde Beaugiron, in Richman's telling she came from an impoverished background and worked as a seamstress until she gave birth out of wedlock to a son, Henri. She knew that she was not able to support the child and gave him to a co-worker who was married and was unable to conceive. She moved on to become a chorus dancer and attracted the interest of a nobleman, Charles. Their arrangement was more than financial but was a true love affair lasting ten years. During this period she developed her natural taste and love for beauty. Charles not only encouraged her but in the end provided her with the means to survive and sustain herself. There were men after Charles, but none who truly captured her heart. Even the painter, Boldini was more of a friend and mentor than a lover. She reconnected with Henri when he was eighteen but the two remained estranged. She did not even meet her granddaughter until Solange was nineteen. It is the telling of her life story to Solange that forms the bulk of The Velvet Hours. I read a lot of books but it is rare that I find one as memorable as The Velvet Hours. The language is sensual and the descriptions of the glittering life of the Belle Époque are captivating. Marthe is a wonderful character, resilient, pragmatic and never less than graceful. Solange herself grows to love her grandmother and as the Nazis move into France, Marthe is able to give her a gift that changes Solange's life forever. The book ends in a mixture of joy and sorrow that I am not ashamed to say brought me to tears. I won't forget The Velvet Hours and will be recommending it to everyone I know. Thanks to Berkley and NetGalley.com for an advance digital copy in return for an honest review.